I generously was invited by the Canadian Consulate in San Francisco to participate in a tour of the Canadian border for three days to Vancouver and Prince Rupert, both in British Columbia. It was an excellent opportunity to learn about border security, supply chain logistics, and free trade. I gained a deeper understanding of the different ports of entry into Canada (vehicle border check points, seaports, rail stations, airports) and how each functioned. This was a tour which was first established after 9/11 and has grown in size and scope. We were a group of about 15 from all around the U.S. together with about 15 Canadian officials, all sharing an interest in U.S.- Canada relations. Participants represented both the private and public sector from a number of states, and the federal government. We were honored to have Consul General Brandon Lee lead the Tour. The Consul General had been posted in San Francisco and is now located in Seattle. 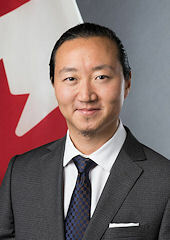 Consul General Brandon Lee joined the Canadian Department of Foreign Affairs and International Trade in 2004. 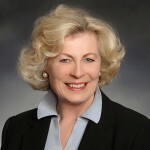 The Consul General previously held senior positions at the World Trade Organization, the International Committee of the Red Cross, and in the private sector as a pioneer of online banking in North America. Geographically, Canada is the second largest country in the world, with a population of 35.85 million and a GDP of $1.55 trillion (World Bank). The United States and Canada enjoy the largest bilateral trade and investment relationship in the world, Canada being the top export destination for 32 states. This number rises to 48 when factoring in states that count Canada within their top 3 export markets. In 2016, two-way trade in goods between Canada and the United States topped $544 billion, down from $575.2 billion in 2015. Exports to Canada were $265.9 billion, making it the largest export destination for the U.S. According to the most recent figures, U.S. companies invested approximately $353 billion into Canada and foreign direct investment from Canada into the U.S. was nearly $269 billion. 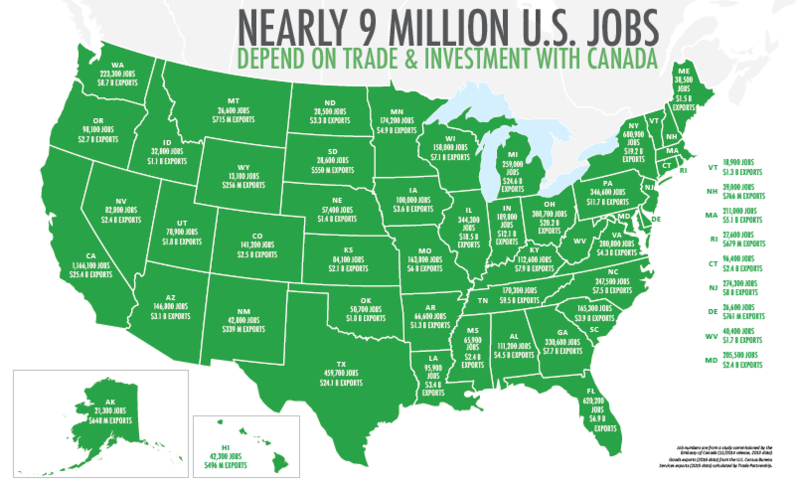 More than 9 million U.S. jobs depend on trade and investment with Canada. Canada sells over 70% of its goods to the U.S. Canada buys more goods from the U.S. than China, Japan and the UK combined (US$267 billion vs. US$234 billion). Canada buys well over two times more goods from the U.S. than China (US$267 billion vs. US$115.7 billion). Canada is the largest single export market for the U.S. In 2016 U.S. imports of goods and services from Canada were U.S.$313 billion. The U.S. trade surplus in goods and services with Canada in 2016 was US$8 billion. For manufactured goods (without energy, mining and agriculture commodities), the U.S. had a trade surplus with Canada of US$34.2B on total trade of US$438.8B. 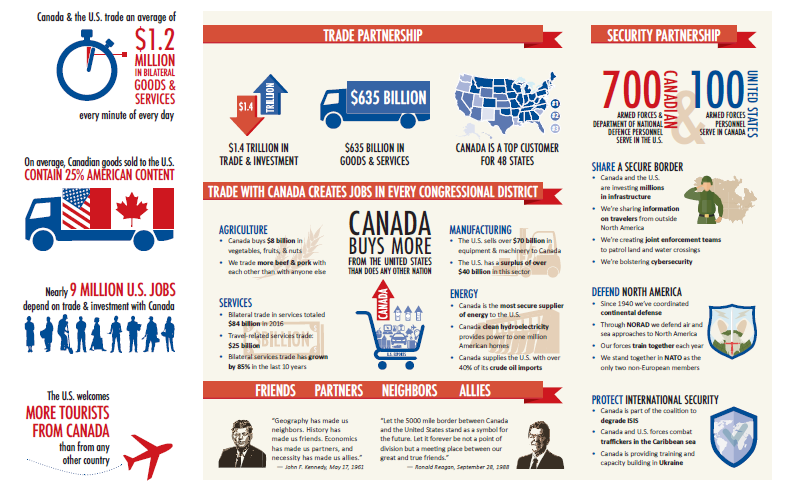 Canada-U.S. bilateral trade in goods and services has doubled under the North American Free Trade Agreement (1994). The U.S. is the single greatest investor in Canada. In 2015, U.S. stock investment in Canada was U.S.$387 billion, representing half of all investment in Canada. Canada is the second largest source of cumulative foreign direct investment in the United States, overtaking Japan in 2016. As of 2016, stock of Canadian investment in the U.S. sits at USD $454 billion, an 83% increase since 2011. Canada accounts for 12% of all foreign direct investment into the U.S. (Source OFII 2017 study on FDI in the U.S., using U.S. Commerce BEA statistics). There are over 5,500 Canadian owned businesses in the U.S. with over 26,000 locations that provide nearly 900,000 jobs. Canada has remained California’s second largest export market since 2006, with a total value of over $16.2 billion in 2016 (9.9 percent of all California exports), as well as exporting $9.2 billion in services to Canada. California imports $27.8 billion from Canada. Computers and electronic products remained California’s largest exports, accounting for 32.2 percent of all California exports to Canada. Exports of agricultural products and food manufactures from California to Canada totaled $3.6 billion; with transportation equipment and chemicals continuing to be strong export sectors as well. California imports from Canada were composed of automobiles, plastics, animal meats, furniture and bedding, and food industry residues. Canada is the United States’ largest and most secure supplier of energy: oil, natural gas, electricity and nuclear fuel. According to the Canadian government, nearly $2 billion worth of goods and services crosses the Canada-U.S. border daily, which is the equivalent of over $1 million traded every minute. 400,000 people cross the Canada–U.S. border daily. Two-way trade with Canada supports an estimated 1,166,100 jobs in California. 41,200 Californians are employed by Canadian-owned businesses. Nearly 1.8 million people visit California from Canada, spending nearly $2 billion. This year marks Canada’s 150th Anniversary, also known as the 150th anniversary of Confederation and promoted by the Canadian government as Canada 150. The San Francisco and Los Angeles Consulates General traditionally host a Canada Day every March in Sacramento. This year the annual luncheon was expanded to include Mexico and California to provide an opportunity to discuss trilateral trade and investment. 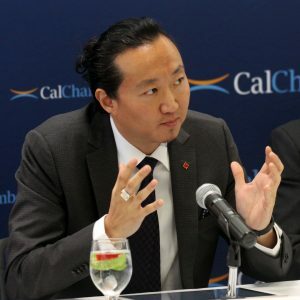 Speaking for Canada at the March 2017 CalChamber – Canada Day event, Consul General Lee explained that under NAFTA, all three countries have benefited from the open and predictable, rules-based trading environment that NAFTA created more than 25 years ago. Trilateral trade within North America is one of the largest economic relationships in the world with more than $1 trillion in goods traded annually. In California alone, more than 1.16 million jobs depend on trade with Canada and Mexico, and more than $200 billion in goods and services are traded between the two countries and California each year. Consul General Lee noted that nearly 9 million jobs in the U.S. depend on trade and investment with Canada and 32 states in the U.S. have Canada as the No. 1 buyer. To put NAFTA in perspective, he said, when you add the number of jobs that depend on Mexico and the U.S., which is 5 million, in total there are 14 million jobs in the U.S. that depend on trade with either Canada or Mexico. The future of trade policy in North America is coming, but changes to NAFTA are also needed, Consul General Lee explained. He promised that Canada will work with the U.S. and Mexico to put forth policy recommendations that will maintain NAFTA as a vibrant tripartite trade agreement. The North American Free Trade Agreement (NAFTA) is an important part of our bilateral relationship with Canada. The CalChamber understands that the NAFTA was negotiated more than 25 years ago, and, while our economy and businesses have changed considerably over that period, NAFTA has not. We agree with the premise that the United States should seek to support higher-paying jobs in the United States and to grow the U.S. economy by improving U.S. opportunities under NAFTA. The provisions of the NAFTA with Canada and Mexico have been beneficial for American industries, agricultural enterprises, farmers, ranchers, energy companies and automakers. Any renegotiation of NAFTA must recognize the gains achieved and ensure that U.S. trade with Canada and Mexico remains strong and without interruption. The CalChamber actively supported the creation of the North America Free Trade Agreement among the United States, Canada and Mexico, comprising 484.3 million people with combined annual trade with the United States being around $1.069 trillion in 2016. In 2016, goods exports totaled over $496.919 billion while goods imports totaled nearly $572.217 billion. The CalChamber now urges a quick and efficient process, and one that does not hinder ongoing trade and investment among the three NAFTA members who must be kept united in the same end-goal of a successful renegotiation. Throughout this process, the Trade Promotion Authority with its objectives and procedures should be followed. Further, during the process, the CalChamber encourages re-examination of the provisions agreed upon by the three countries during the already negotiated Trans-Pacific Partnership, as these may provide a starting point for further discussion. The third negotiating round is scheduled to be held in Ottawa from September 23-27, with a target date for completion still scheduled for around the beginning of the new year.